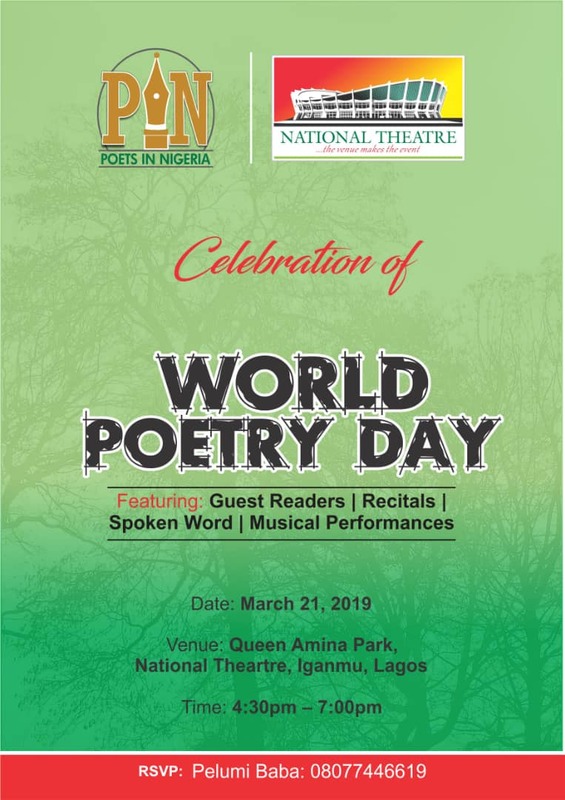 Poets in Nigeria (PIN) Initiative in conjunction with Management of National Theatre, Lagos, will be celebrating the maiden edition of PIN – National Theatre Annual Celebration of World Poetry Day on March 21, 2019. Celebration of World Poetry Day is hinged on UNESCO’s proclamation at its Paris, 1999 session. As poets and lovers of poetry and the art, Poets in Nigeria joins the world in commemorating this special day towards highlighting poetry and its numerous advantages to humanity. Featuring: Guest readers of poems, poets and performer poets, musicians, etc. Ready is a basket of poems from which guests would be required to pick and read from. However, guests could recite or perform poems they are familiar with.